Almost everybody who use chrome would also be using one or the other extension. A lot of extensions work behind the scenes, but a lot others would need you to open them explicitly. For instance, I use scribefire to update all of my blogs. But I need to launch it by clicking on it's launch icon. Finding and clicking an icon every time to use an extension could get boring especially if you need to use it daily. But what you didn't know is that Chrome lets you assign shortcut keys to open any extension. And like a lot of other features, this one also is a bit hidden. First open the extensions tab from Tools->Extensions. Below the list of installed extensions, there is a link "Configure commands". Click on it. This will bring up a popup window where you can assign shortcut keys to any extension you have installed in Chrome. Just click on the text box to the right of an extension and key in the extension you want. That's it. From now on, you can simply use the shortcut to open the extension in Chrome. Please note that you are creating a Chrome shortcut and not a system shortcut. That means You have to be on the chrome window for the shortcut to work. Finally here's a video if you want to see it in action. 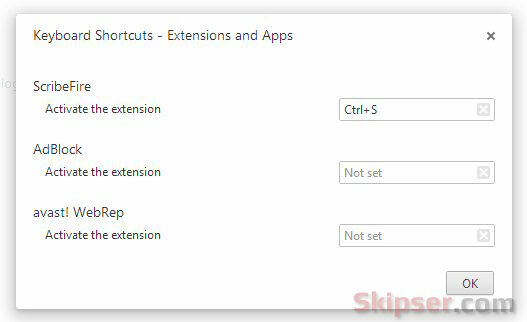 Simple trick to assign keyboard shortcuts for chrome extensions.